NEW YORK (CNNMoney) -- Verizon's record iPhone sales last quarter came at a steep cost. The nation's largest wireless company sold 4.2 million of Apple's smartphones in the fourth quarter, which helped Verizon's wireless revenue surge. But Verizon (VZ, Fortune 500) heavily subsidizes the pricey iPhone -- an expense that dragged down its wireless profits. Fran Shammo, Verizon's chief financial officer, largely shook off analysts' concerns. Those high costs are simply the price tag of doing business with Apple (AAPL, Fortune 500) during the holiday season, he said on a conference call Tuesday morning. Rival Sprint Nextel (S, Fortune 500), for instance, recently said it expects to lose money on the iPhone until 2015. Shammo insisted that Verizon's profit margins were otherwise growing, and that the company has costs under control. Verizon expects improvement in its expense-to-sales ratio as a growing number of customers migrate to its more efficient 4G-LTE network. He also said that price increases were a possibility. Verizon's wireless rates are already among the highest in the industry, but after AT&T (T, Fortune 500) raised its rates last week, analysts wondered if Verizon would follow suit. Shammo wouldn't commit to an answer, but he acknowledged that the company is looking into it. One way Verizon might alter its price structure is by creating family-share data plans, Shammo said, which he called "a win-win for the customer and for revenue accretion." Customers could also see "more movement on device pricing than service pricing," he said. Verizon already offers many 4G smartphones for $300 -- a higher price than most of its rivals charge. But from Verizon's standpoint, the price tag works. The company said it was pleased that it sold 2.3 million 4G devices during the past quarter. Shammo admitted that Verizon's 4G is a "premium-priced product," but there remain "niches of people that want to be on the best network in the world." Despite recent nationwide outages in its 4G network, Verizon believes that "niche" will rapidly expand. The company expects to move many more 3G customers to 4G next year. That's because the wireless giant's smartphone sales are off the charts. The company had its best quarter ever in terms of smartphone and 4G device sales and upgrades. About 44% of Verizon's wireless customers are now smartphone customers, up from just 28% a year ago. The company sold 7.7 million smartphones in the fourth quarter, and of the phones that it sold with a two-year contract, a stunning 70% of were smartphones. Wireless sales grew by 13% to a record $18.3 billion. Thanks to the iPhone factor, Verizon's wireless earnings fell 5% in the quarter, and the company's wireless service profit margin was squeezed to 42% -- down sharply from almost 48% in the previous quarter. For the year, Verizon said it sold 10.8 million iPhones and 14 million Android devices. Sales declined nearly 2% and profits were flat at Verizon's comparatively struggling wireline business, though the division was buoyed by rising FiOS adoption. Overall, Verizon said its net sales rose 8% to $28.4 billion during the fourth quarter, in line with analysts' forecasts. 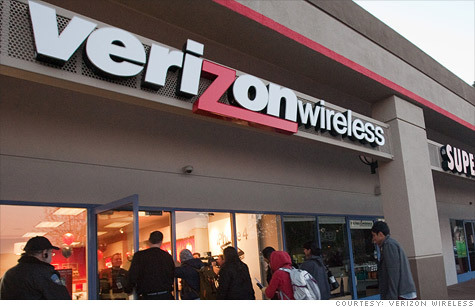 Verizon lost $2 billion in the quarter, primarily due to charges related to its pension plans. Excluding those charges, which analysts typically do not include in their forecasts, Verizon earned 52 cents per share. Analysts surveyed by Thomson Reuters expected earnings of 53 cents per share. This year, Verizon's CFO said the company expects to earn around $2.20 per share, slightly better than analysts' forecasts. Shares fell 2% in morning trading Tuesday.